Claire and the Ornithological Shadow is the story of an awkward, lonely young woman with a passion for birds. 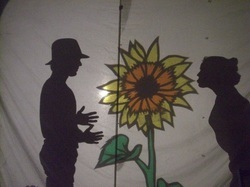 Claire befriends a shadow and a new world of possibilities is opened to her in this whimsical and touching original play. Weaving performance, shadow play, puppetry, and live music, this simple yet beautiful production reminds us that change is not always as hard as it seems. "The sweetness of No. 11's vision and the way it comes to fruition already distinguishes this young company from the rest of the pack."